For all those players who plan to build a FIFA 19 Premier League squad, we’ve conducted an extensive analysis on the best players. Here is our guide to the top English league in FIFA 19 Ultimate Team. 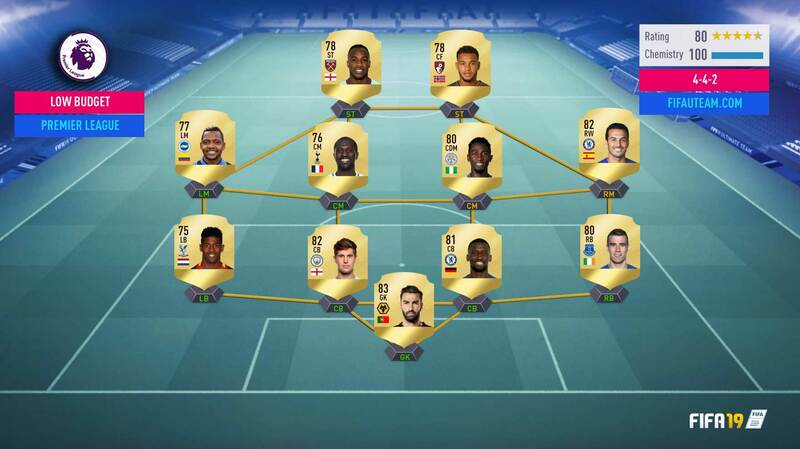 Building a team is the biggest challenge in FIFA 19 Ultimate Team. It doesn’t need to be the best team, this is because the budget may not allow it, but it needs to be the player’s stature for him to obtain success. When choosing which players to play with, you will have to look carefully at their attributes. 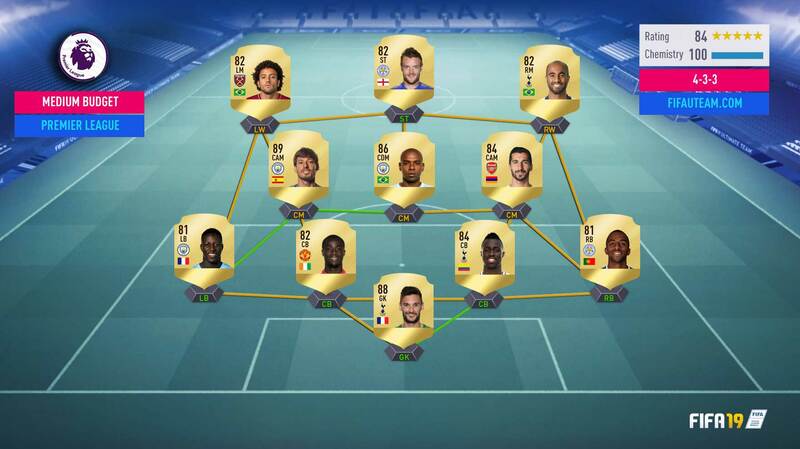 Choosing a team based on ratings is one of the most common mistakes on FUT 19. It’s precisely this aspect that this guide focuses on. For each position, and focusing on the truly important attributes, we’ll show you who are the best athletes to choose. It’s also important that the player checks to see if the player he chooses fits the formations he likes to play in. For example, a good full back will be useless if the player only uses a formation with three defenders. According to these formations, the player must be cautious and look at the work rate. Try to relate them with the ones we advise in our Formations Guide. Last but not least, it’s mandatory that you tune all of your team so that the individual and team chemistry will be as high possible. For this last step to be easier, the majority of the players start to define the type of team they’re building. Some choose to gather players of the same nationality, while others decide to form a team of players from the same league. There are also more experienced players that can form hybrid teams without damaging team chemistry a lot. All of these steps are necessary to have, or it could mean that the team is not always well built as it could be. 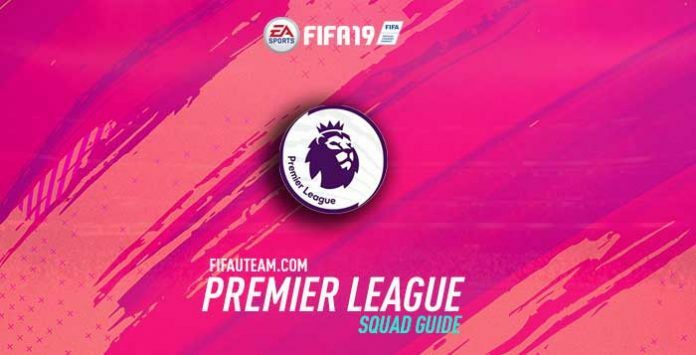 This article aims to help those that want to form a FIFA 19 Premier League squad. Even the players that have a EPL team, could take out some valuable conclusions from this guide that could help you make your team even better. We received thousands of comments about similar guides that we have published in previous years. Most of them have asked us to help improve their teams and the players they had. It’s important that the readers understand that this guide is simply guidance. It’s a theme too vast and the player combinations are almost infinite. Besides, there are various factors that influence the choices, like one’s style of play, the formations and custom tactics used, the available budget, the preferences or even the time spent playing. There’s still one uncertain component: a good player for someone might not be for another. If there was a better team everyone would fight to get it. Part of the fun of FIFA 19 Ultimate Team is this: everyone has their personal club and players. Remember that this year, we published separate Premier League guides for each position. You can visit them, clicking in the colourful links in the top of this page. In this guide we didn’t consider silver or bronze player. Most players don’t assume them to be a better option than gold players, so to simplify the guide’s analysis we didn’t include them. In the future we may come to publish guides exclusively talking about these qualities. In this guide we didn’t consider In Forms (IF). They’re extremely expensive and in most cases are not considered good value for money. They should only be used by players with generous budgets, that already have the best team possible and that want small upgrades. In this guide we didn’t consider players that have been transferred to other clubs or that have been reviewed (UP). Only players that started their season in the Premier League and with their original attributes were considered. In this guide we didn’t consider changes made on a players performance such happens when applying training or chemistry styles cards. Over time, prices change. That’s why we added a link where you can check anytime the updated prices. No league is as spectacular as the main football competition in the United Kingdom. The champions in the second biggest league in the world are made through the made points system. Whichever team gathers the most points wins the league. The top four teams gain access to the champions league of the proceeding year, while the last three trade places with the first three promoted teams from the Football League Championship. Every season starts in August and finishes in May, having 38 game weeks with 10 matches each, being a total of 380 matches per season. The Premier League is the most watched football league in the world, broadcasted in 212 countries and in more than 600 million homes. It’s also the second football league with more assists and the second best league classified in the UEFA league coefficients. Since the competition began in 1992, the Premier League has only been conquered by six clubs. The dominant club is Manchester United, with a total of 13 titles. London’s teams together only won the league eight times while Manchester City won it three times. The outsiders Blackburn Rovers and Leicester City did it once. The team making decisions are made tougher, but in a good way because of the vast quality of players in the league. Keep in mind since it is in the United Kingdom where FIFA 19 is played the most, the Premier League is the most seen inside game’s teams. This means it is also the most expensive league, so it is not recommended for players with a limited budget. The team suggestions that follow are simple graphic indicators of the Premier League articles already published. They should serve merely as orientation because it’s impossible to build a team that fits everyone. They depend on various factors we don’t know such as budget, formation, custom tactics, style of play and player preferences. To try and explore the needs of the maximum player as possible we suggest three teams with different budgets and formations: 4-1-2-1-2 with unlimited budget, 4-3-3 with medium budget and 4-4-2 with a low budget. Please, keep in mind that we are not saying that these are the best formations for this league. They are only generic formations to be used in all our squad guides. The choice for this team’s players was based on the analysis made in the previous articles. De Gea is the natural choice to the goal. Now that Courtois has move to the Spanish league, no one can be compared to him. Van Dijk, Azpilicueta and Walker are also easy choices to the defence. On the left side we picked Mendy, but we recognize that he hasn’t the same quality of the other ten players of this team. One of the options is to replace him by someone else with a lower chemistry. An Icon would be great but having Alba linking with Azpilicueta is also an option you should take into consideration. We used this formation not because it is the best for this league but because it is the standard formation we use for unlimited budget squads of our guides. This means that we have only two spots for three players. Kante and Kevin De Bruyne are incredibly good, especially in their positions: CDM and CAM. If you don’t want to relegate Pogba to the bench, you should pick another formation. If Hazard has his spot guaranteed every year, on the opposite side things are a bit different. Thankfully, Salah got a huge upgrade and gives the quality that was missing to this position. Once again, one top quality striker have to go to the bench. In our opinion, Aguero and Lukaku are the perfect pair but if you love pace, maybe you will want to replace one of them by Aubameyang. Once all the players reach maximum individual chemistry via loyalty (achieved by each player after 10 matches for your club or by being pack pulled) you can go without a manager for your squad. They’ll be of no use while wasting contracts. The choices for this more affordable team players were based on the analysis made previously. In goal, Lloris will keep your goal safe. If you think he is too expensive, then you can go with Ederson. Davinson Sánchez and Eric Bailly are both fast and solid defensively. Mendy is the only player who keeps his spot in this team. Ricardo Pereira’s assertiveness completes our defending foursome. Fernandinho is perfect to play in the centre. He has the muscle that every midfield needs. Mkhitaryan and David Silva complete the midfield. Lucas and Felipe Anderson have guaranteed place in this team. Sterling and Martial are great but also too expensive to this squad. Over the attack line, unless you need the 5 star skills of Zaha, Vardy is an excellent choice. If you still have some room in your budget, Roberto Firmino, Fabinho, Dembélé, Mahrez and Martial are players that would improve this squad a lot. The choice for this budget team was based on analysis published previously. Rui Patrício is our choice for the goal. He was one of the good additions this year to the Premier League: a must buy for every low budget squad. Coleman, Rüdiger, John Stones and van Aanholt complete the defence. In the midfield, Ndidi and Sissoko complement each other well. Both are strong players but while the first gives security to the back line, the second is a player that usually pushes forward to assist his colleagues. Izquierdo on the left (obviously!) and Pedro on the right fill the wings in order to assist Michail Antonio and King who have both been chosen for their combination of pace and finishing stats. 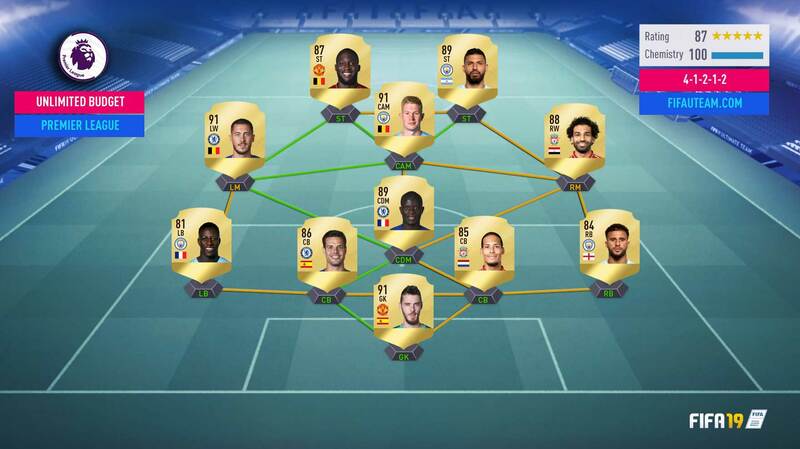 Follow our tips and you’ll become more successful on FIFA 19 Ultimate Team with your Premier League Team. We have reached the limit of comments for this page. For that reason, the comments are now closed. If you have any question, please scroll down and read the 100+ questions answered. Thank you. Looks OK. If it is working to you, don’t make any change. Right now I have the Medium Budget squad with Valencia, Azpilicueta and Pedro Legend, and made about 125k coins p/ week the last 2 weeks (excluding sells). Right now I have 110k. – Going forward, do you think some improvements like Fabinho, Firmino, are worth it? Or should I go straight for the best players? – For a single striker, what would be your choice? Kane seems a bit too slow, Aguero too small, maybe Lukaku? Firmino until I can get one of the best? 1) Buy now Fabinho and Firmino. As soon as you have coins for the best ones, go ahead. This will give you time to buy them for a lower price. I only have 20K to spare. Hi. You have a nice team. Maybe you should improve a few players: Gabriel Jesus and Rui Patricio would be a good start. any tips on a good RB for a Premier League team? I currently use Trippier because of his amazing passing skills, Walker doesn’t seem much as an upgrade besides speed and a small difference in defensive skills and i’m not sure if IF Valencia RM on 6chem is going to do me any good. Do you have any experience with these guys and what is your personal favourite? Yes. Walker is our favourite. Nice team. It’s not easy to improve it. Maybe you will need to turn this into a hybrid squad to take the best from more than one league. Hi. Assuming that you don’t have many coins to spend, I will suggest you Matic or even Dembélé. If you have enough coins, Fabinho and Fernandinho would be great. Ty I have got Fabinho and Fernandinho now and what about second team as I use 2 teams. Dembélé and matic? Yes, looks OK to me. do you have any advices for supersubs for my team? First squad is okay, but i have quite no bench atm. Hi. Do you want a fitness squad? Why don’t you try one of the ones we suggested in the league’s guides? I am searching for those players, that can be gamechangers when they come in. My suggestion is to make a guide for the perfect bench for different budgets. I will search for my own in your league guides! What can I do to make this team better, thinking about getting a better Lw. Hi. When you have a top player like Reus CAM, maybe you should build a team around him. What you did was the opposite. If you want to keep this team, try to buy one at least of the recommended CBs. What do you think I need ? Nice team! However, I can’t understand why do you have so many UCL cards. They are so expensive! Not good value for money. Did u think i can sell some UCL card and replace them with better or same and save money??? So please can u help me about selling and tell me the players xho come in their places? For example: isn’t Azpilicueta NIF item better than Bailly UCL item? I play 433 (4) or 4321. I’m saving for Davinson Sanchez to replace Sokratis. Regarding midfield could I get better players than Dembele and Mkhitaryan for the same price? Who should I get? I ask this because I have a second team with Rabiot, Guilavogui and Tolisso on the midfield that feels so much better compared to the midfield mentioned above. To be honest, your midfield looks OK to me. I don’t think you could improve it without spending a good amount of coins. Thanks for your reply. I’m getting used to those 3 and with alli um adittion. After getting Sanchez I’m aiming for eriksen. Do you think I should improve any sector before this? No, you are going fine aiming to Eriksen. You can get Sané on loan from the EASFC Catalogue. That way, you can try by yourself and see which one is better. Which is better… Mané or Sané? Help me please, everyone I ask it have a different answer. As you can see here, it’s Sané. Hi. Sergio Ramos instead of Piqué is an obvious one but I also believe you should try to find someone better than Silva and Busquets. I have 120.000 I think i’m going to buy Sane and Lorris, What do you think? Hi. You can’t play with Alisson on that team. Lloris would be great. I also think that you need a top-quality ST instead of Morata. That should be a priority over Morata. First of all, Thank you. Your guides help me a lot. My Team 4-3-3 (2) needs an Upgrade. I am saving up for Pogba and Kante but that will take forever. Any suggestions on what i should get next? Hi. Thx. There is no much you can do to improve your team without spending a good amount of coins. In my opinion, your priority should be a better ST. I found Aubameyang in a pack and I think I’m going to sell him. I’ll have about 500k, who do you think should I buy? I thought about buying Lloris, D.Sanchez, Valencia, Aguero, Sanè and maybe Fabinho, Eriksen or Lingard 85 in place of Paulinho but I don’t know…. Hi! 500k is a really good budget. Lloris, D.Sanchez, Valencia, Aguero, Sanè are all good improvements. If you want a more defensive approach, I suggest you Fabinho. Otherwise, go fo Eriksen. I’m realy happy of my team, specialy of hazard on CAM and strong miedfielders. I was thinking to swap de.gea, van.dijk, sanchez for courtois, varane and umtiti. Van.dijk is a beast but not sure about sanchez. Which option is better? Same hemistry. Amazing team. Dijk is better. Im thinking of replacing Neuer with Hugo Lloris first. Can you suggest what i need to change next and to whom?? Hi. Your next upgrade should be your CBs. Azpilicueta and Sanchez looks good choices to me. You are planning well. Black Friday is coming so all you have to do is to check his price a few days before it goes out. Why don’t you try KDB instead of an Icon? You think that Kante is better than fabinho ? And what do you think of Dembele should i need to replace him for another cm ? Yes, Kanté is better than Fabinho. Pogba would be perfect on Dembele’s position. Thinking to replace dembele cause of pretty low stamina, who should i buy for cm then? Suggestions: buy Azpilicueta, place Mkhitaryan as CM and save for Eriksen. pereira, van Dijk, Bailly or Alderweireld?, Mendy. Hi. Bailly is better than Alderweireld. You should also look to another ST because Deeney is good now that he has pace and shooting boosted but it won’t be that way the whole year. I have 300k to spend…but I am very confused with who I should change and upgrade. I know gueye is a weak link but I really like him in-game. Would like some structured advice. Thanks! 300k is a great budget, especially now that prices are dropping. You can invest in a top-quality ST, like Lukaku, a better GK, like De Gea and in a stronger midfield (Eriksen would be perfect). I am playing with a 4-3-3 (2) Hold. DM : Ndidi / ??? LW : Bernard / ??? Any suggestions on players i should remove or buy? I like to play a high pressing game so the work rate of my players defensively should be high preferably. Hi. You need better CBs, like Sánchez, for example. Your team is unbalanced. Matic and Rashford are the players that are missing. Who do you think i should sign next ? I thinking of signing Son , Willian , Matic . Matic, definitely. You also need a better LW and a good CB like Sánchez. Do you suggest anything to improve? I have 100k. Thanks! Prices are dropping, so wait a few more days and buy a top-quality ST, like Lukaku. Davinson Sánchez and Dembele would fit perfectly on that team. I have a question for you about your opinion for the best Goalie in the game? I do have now De Gea but I got also Courtois in a pack , who you think is better between both of them? De Gea is the best one. But I have a Cristino Ronaldo…..
Or you think I need to buy some Icon like Pelé or Ronaldinho. You have a decent defensive team. Follow our guides to know who should you improve next. I have about 60k which player should I upgrade or should i just save up some coins for top players ? You have a very balanced team. My suggestion is to save for Eriksen. I’ve used Martial and Sokratis but didn’t get on well with them. I’m also not a skill-master(!) so not bothered about number of skill stars. If you will wait for Black Friday, you probably will have enough coins to buy Sane, Auba and Valencia. They will improve your team a lot. Sane should be a priority since this is where you need the biggest upgrade. Another top CB may be useful too. i have about 200k left , who should i replace in my team ? We believe that your next improvement should be someone to replace Keita. Dembélé should work. Kovacic instead of Wijnaldum would be a good move too. Third priority is the ST and then the LW. Firmino and Sané would be amazing but you can’t wait a few more weeks because their price will drop a lot. Hey Rodrigo. Looking for some advice. Running a 433(2) formation and in your guide you have Kovacic and Dembélé for cm. I can’t afford pogba. Are there any cams that can play cm or are the cm better? Currently thinking of trying 433 out. What players would u suggest using this? Pogba, Kanté and KDB; Salah, Hazard and Aguero. Thanks. What about second team? I think that it has to be you to discover who are the best ones. We can give you a guidelines, but the team is yours and we all have different preferences and play styles. You have a nice team. You will need coins but Eriksen would be a great signing. Eriksen is crazy good, his long shots are out of this world. Sorry, but what do you mean by ‘two team’? The second team? Lloris, Valencia an Mkhi are untradeables. I play either a 433-2 or 4231-2 and have about 120k. 1. In what order should i upgrade? LB, CDM or RW first? They all are doing an ok job so far so not sure which one to upgrade, if any. 2. I packed sane, should i keep or sell. Im having fun with him but i have felipe anderson as well who i like also, so wondering if i should sell sane to get other quality players. Do you feel the drop in quality between sane and felipe is big? 1) If you feel OK, then you don’t have to upgrade any of them. Probably with a few more games you will identify who is the weakest one. 2) Yes, the difference between them is big. If you want to have fun, keep with Sané. If you want to make coins, sell him. His price will drop a lot in 1.5 months. Is mane worthy of any of these teams? You should look into the midfielders guide. Joshua King on the budget squad is not Joshua King. It was Coleman. Sorry. It is now fixed. Thank you.